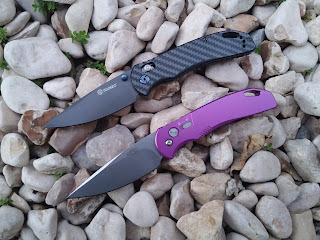 Best Chinese Knives: Ganzo Firebird G758 G7582AL Aluminium Automatic Switchblade Knife Review! Ganzo Firebird G758 G7582AL Aluminium Automatic Switchblade Knife Review! I have received the knife from Fasttech and would like to share with you my review of it. The knife comes in a new Firebird branded box, with a microfiber sleeve. First impressions: The knife feels pretty light in hand, no visible scratches or nicks, opens fast from the beginning - very well done! 1. Blade centering, lockup, sharpness, grind - all are done great! So is the stonewash finish on the blade, really liked it. 2. Mechanics are also awesome, opens smoothly and fast, with a small kick. 3. Safety - finally they have done it right! It is solid, made from aluminum, doesn't wiggle and has a nice tactile feeling to it. Kudos Ganzo! 4. Pocket clip is finally in the right position - tip up carry. 5. The handle is made from 2 pieces of aluminum, screws are only visible from the clip side, which adds to the overall clean look. In my case it has a purple anodizing, which also looks unique and adds color to my collection. 1. The pocket clip is poliched, I would really prefer it stonewashed, like the blade. 2. The blade has marking on the other side "Made by China Ganzo". A smaller "Ganzo" writing would have been nicer and cleaner. 3. The inside of the handle slabs feels a little sharp, smoother edges would feel better. The Verdict - this is a huge leap for Ganzo/Firebird knives, the knife is well made and feels much more expensive than the price it is sold at. I can't wait to see which aluminum model Ganzo will come out with next! I really hope it will be something Microtech style (Microtech Socom Elite Mini for example), another Protech style or a small, sleek auto knife.